“You can’t lead by assumption.” – I definitely was guilty of this in my coaching career. I assumed they knew what I knew and that was a mistake. I found them at their ground and not mine. “Make every day your masterpiece” – I had a lot of days where I woke up in the morning and I tried to make it through my day. This enlightened me to make the most of my days even when they may not be the best. Time is precious and with great opportunity comes responsibility. “The more you learn, the more valuable you become” – I took this principal to heart and tried to learn as much as I possibly could. I was diligent in taking notes for every learning opportunity I was presented with. I feel my knowledge has substantially increased since February and I’ve become a better coach because of it. Some of the specific things I mentioned above had a positive impact on my coaching. I also took more time to build on the relationship piece with my players and students. I made time for more one on one interaction. I know sometimes as coaches we put too much value on a player’s performance so I made a conscientious effort to spend just as much time on a players personal life as I did on their sport. I highly recommend the 2019 CLN event to any coach on any level. This is a first class event with first class speakers. I know as coaches we are extremely busy with very little free time but I encourage any coaches out there to make this event a top priority! You will learn valuable information and feel energized as you walk out those doors. Jeremy Muyres is a health and physical education teacher at Peachtree Ridge. 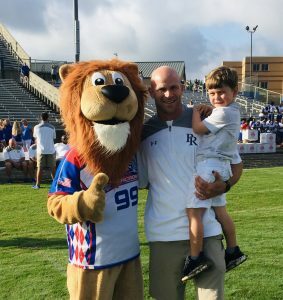 He is also the strength and conditioning coordinator for the Peachtree Ridge football team. He has been teaching and coaching sports for the past 10 years. His areas of specialized expertise are working with student-athletes in strength and conditioning as well as coaching and mentoring players on and off the football field. Jeremy is a graduate of Georgia Institute of Technology and majored in Business Management. Jeremy is very active with Fellowship of Christian Athletes continues his involvement in FCA as the school’s club sponsor. He is also an annual speaker at Gwinnett Student Leadership Team’s summer summit.